Power Options are no longer trading. For a list of alternative brokers, and full comparison reviews, visit our brokers page. 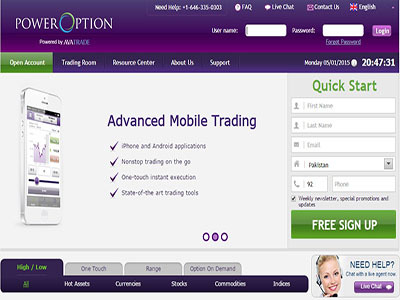 Established recently in late 2013, most traders would hesitate to sign up with a brand new binary options broker. However, you’ll find that with PowerOption, the same reluctance is not there as traders are confident with this broker. Why is this? Well, it’s largely due to the fact that PowerOption is part of the long established forex broker, the Ava Group. Now, if you’ve ever traded forex in your life, it’s almost certain you will have heard of AVA. The parent company, AvaTrade has been around since 2006 and currently turn over around $60 billion worth of transactions every month as a forex broker. So knowing PowerOption is backed by such a strong group gives traders the confidence to trade with them. The lack of operational track record on PowerOption’s part no longer becomes a concern for traders. Access to customer support is by means of email, live chat and the telephone. Traders shouldn’t have any difficulties contacting the support team as the support service is available 24 hours a day from Sunday to Friday. Rather than relying on generic binary trading platforms such as those provided by SpotOption, PowerOption has resorted to MarketsPulse to provide then with a more appealing trading platform. Apart from being extremely user friendly, one of the key attractions of the MarketsPulse trading platform is the ability for traders to trade directly from the charts provided. Traders will notice the additional arrows (one for Put option and one for Call option) next to the current market price. Trading support for mobile traders is also available with the mobile trading app easily downloaded from Google Play or Apple Store. PowerOption’s asset list consists of 38 different types of underlying assets. Although they might not have the widest range, considering traders can trade them with 5 different types of trading contracts such as Classic High/Low options, Touch options, 60 Second options, Range options and Options on Demand, the list is more than adequate. At PowerOption, all traders are regarded as VIP traders and hence there is no trading account differentiation. There is only one type of trading account and traders are required to make a minimum deposit of $100 or €100 (depending on the account currency base) when opening one. In general, PowerOption pays their traders up 85% returns for normal binaries. For One touch options, the returns can be higher reaching up 500%. Unfortunately, there is no rebate for out of the money trades. However, PowerOption did announce that rebates will be made available soon. As the bonuses offered by PowerOption, they are based on a ladder format with the lowest rung starting at 50% (up to $299 in deposits) going up to a maximum of 100% (above $500 in deposits). While PowerOption may be a newly established broker, they follow the same standard of security protocols as those in AvaTrade. This means traders do not have to worry about the safety of their funds as these people uses only the most advanced security provisions in protecting their clients’ money. Given the low minimum deposit requirement imposed and the single type of trading account offered by PowerOption, one can tell that this broker offer benefits which are conducive to beginner traders. And while they might be based in the Seychelles, traders need not be overly concerned about that fact. The main thing is to remember that PowerOption is part the AvaTrade group and a legitimate brokerage firm with good standing in the industry.